What is being done about tree mortality Statewide and in Plumas County? In October 2015 Governor Brown declared a state of emergency throughout California and sought federal action to help mobilize additional resources for the safe removal of dead and dying trees. 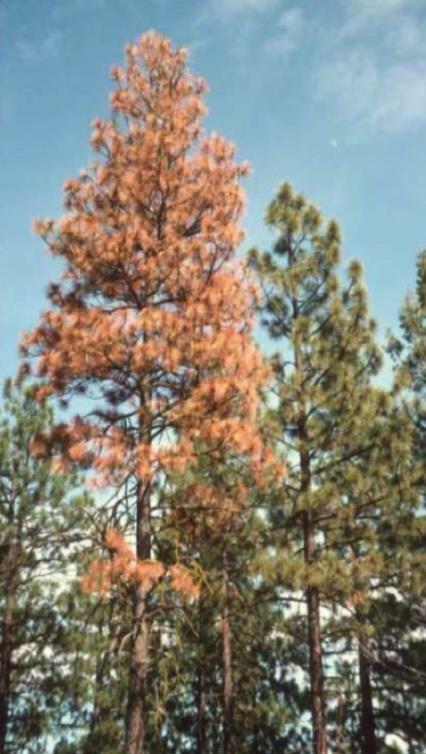 By November 2015 the California Office of Emergency Services and CAL FIRE had organized the California Tree Mortality Task Force. Initially the six hardest hit counties in the south and central Sierra region were target as High Hazard Zones for help by the State task force. In June of this year four more counties to the north of the initial area were added to this zone (El Dorado, Calaveras, Amador, and Placer). Sierra Nevada areas within these ten counties are receiving the bulk of agency workforce and grant funding support from the State Task Force. The goals of these efforts are to remove dead trees in order to protect public infrastructure: roadways, utility lines, water systems, public buildings, and communities. So far about 425,000 of the dead trees have been removed. For the time being with resources stretched, areas away from infrastructure and communities cannot be aided. Both local and state tree mortality groups have developed collaborative efforts to remove hazardous trees, responsibly dispose of the material, meet permitting requirements, and seek funding. Additionally, existing task forces have developed outreach material to increase public awareness, coordinated tree heath evaluations for private landowners, and provided funding and technical assistance. The PC TMTF is a collaborative group of 35 agency, industry, and individual stakeholders brought together by the Plumas County Fire Safe Council and the Plumas County Office of Emergency Services. Local Incident Management Plan and notes from the Task Force meetings are available from the Plumas County Fire Safe Council.